We are happy you have chosen to visit our website and hope it will lead you to our fellowship. Several topics are listed here that should answer questions you might have before you visit us. The church faces Broadway Street. The parking lot is on the north side of the building and is accessed from West Street. From Broadway, turn north onto West Street and enter the parking on the right. You can also park along the street on Broadway or West or any other side street in the neighborhood. There are four designated handicap parking spaces directly in front of the church. There is a wheel chair ramp leading to the east entrance. An elevator is located directly inside that door. A greeter will be able to assist you. The elevator will take you to the sanctuary level or to the lower classroom / fellowship area. Another lower level handicap entrance is available for social events. This door can be reached from the parking lot where there are other designated parking spaces. Follow the signs around the corner of the building to the entrance. 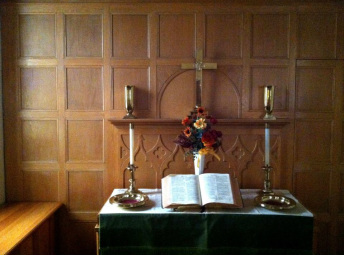 Worship services are held on Sundays at 10:00 am in the Sanctuary with organ and piano music. Our worship service usually lasts about one hour. After the service you are invited for conversation and refreshments in the lounge, which is located right behind the choir loft. We hope you'll stay to get to know us better and to have your questions answered. We usually begin our services with words of welcome and a sharing of joys and concerns. With occasional variations, this is followed by a call to worship, a gathering song, opening prayer and a hymn. The children gather at the chancel steps for a few minutes with our pastor, after which they are dismissed for Sunday School. The chancel choir or soloist will sing a musical selection. Our Lay Reader will read from the Bible and our pastor will give a message focused on the morning Bible reading. Following the message we sing a hymn and take time for prayer. We receive an offering, sing a song, and share news of the church, after which the pastor offers a closing blessing. Our sanctuary is equipped with a wireless sound-enhancement system, available upon request. Simply ask an usher to assist you. Children and young people are always welcome in the worship service. After the Children's Time, they may choose to go to Sunday School or remain in church with the folks who brought them. On the first Sunday of the month, all children stay for worship. There is a responsibly staffed nursery available for children kindergarten age and under. The nursery is accessible through the lounge and up a short flight of stairs. As you enter, an usher will hand you a program that lists the parts of our service. You are welcome to sit anywhere in the Sanctuary. A greeter will gladly help you find a seat if you wish. Songs are referred to by number and can be found in the books in the seat pocket in front of you. The greeters in the back of the church will be happy to assist you should you have any questions. Our main musical instrument is a Clavinova piano/organ combination. Most of the music uses the piano mode but the organ mode is used to accompany many hymns. From September through May, our Chancel Choir performs a special selection each week. They also offer two cantatas each year during the Christmas and Easter seasons. There is no expectation that you will make a gift, but gifts are always welcome. For us the offering is our way of saying thank you to God for the many blessings we have received from God and for all God's goodness to us. We can say thank you in many ways: by financial gifts, prayers, by dedicating our lives to greater service and compassion, etc. We understand giving to be a spiritual act of dedicating what we have and who we are to serve God. The gifts we receive go to support the church and its missions and ministries. Communion is ordinarily served on the first Sunday of the month. We welcome all people who are seeking a closer relationship with God to come to God's feast of love. If you choose not to receive communion, that is fine too. Communion is usually served by ushers. They will pass trays of communion bread and small cups of grape juice. Each participant holds the communion element until all are served so all partake together. On occasion, communion is served by intinction. That means we go to the front of the worship area where each person is given a piece of communion bread which you dip in grape juice and then consume it on the way to your seat. There is no dress code. We hope you will feel comfortable here, no matter what you wear. Some people wear suits or dresses; others come in casual slacks, jeans or shorts. Whatever you wear, we will welcome you.